Breaking & Entering is the latest original production at Zombie Joe's in North Hollywood. Honestly I didn't quite know what to expect. For one thing, there was the startlingly well-stocked set--complete with desk as well as sofa and screen. Given the black box nature of ZJU I'm more used to minimalist sets. The reason became clear soon enough. W.J.Trumbull (Matthew Sklar) lives here, a recluse novelist who wrote a bestseller decades ago. Not just his home, this place is his fortress against a world that he doesn't want or like or trust or...something. Therein lives one the many mysteries. Mysteries that may (or may not) be solved by evening's end. Trumbull is trying to listen to a baseball game, which (to his intense annoyance) includes a commentator (Jerry Chapell) who quotes him over and over. There's a small power outage. Hence enter a girl (Catherine Canipe). She, as per the title, breaks and enters into the author's home. She introduces herself as Milly Smith and demands he read her novel. Cue the groans and laughter. But...we proceed from there to something far more interesting, and only a little less funny. Trumbull predictably enough rolls his eyes, but also engages in conversation. He listens to some of what Milly has to say. Asks a couple of questions. Offers her a drink. And little secrets, confessions, possibilities begin rearing their heads. Why hasn't Trumbull written anything in fifty years? Or has he? What happened to the man's wife? Milly insists her novel tells the story of what is happening between them right now. How can that be? Meanwhile, every now and then, the sports announcers come back and tell more about what must surely be the longest baseball game in history (Jason Britt portrays the second announcer). In effect, what we're seeing is a journey inside a human mind, complete with metaphorical commentary. This sort of thing can crash and burn real easy. Done with preciousness or self-consciousness, plays like this fail. What they need to work are actors who commit totally to the emotional truth of what happens, the moment-by-moment interplay. Given the leads recently appeared together in the delightful (but campy) Captain Dan Dixon Vs. The Moth Sluts from the 5th Dimension, one might halfway expect/suspect a similarly campy approach. But...no. Canipe and Skar never avoid the humor of their scenes, yet they remain deep inside the story, reacting not as actors but as characters. The result is something like a cross between Sleuth and Six Characters In Search of an Author. I find myself not wanting explain what that means too much. Far better for audience members to experience the reality shift for themselves. fact be real? But if so, should one of these two be only a figment of the other's fertile imagination, what I couldn't decide was which was which? Is this a fantasy on the part of Milly, her novel as she sees it playing out? Or is a sequel by Trumbull to his long-ago best-seller, delving into the weird world of his imagination. Or, her imagination? You know what? I'm still not sure. About any of it. But like the end of The Usual Suspects or The Turn of the Screw I'm still pondering. Colin Mitchell wrote this play, a lovely tour-de-force of character and language which I for one enjoyed thoroughly! Sebastien Munoz directed, whose skills in that position I've watched with growing appreciation. The whole production showed more focus, as well as the energy and fun which usually go with his plays. Makes me look forward to his next directorial effort that much more. 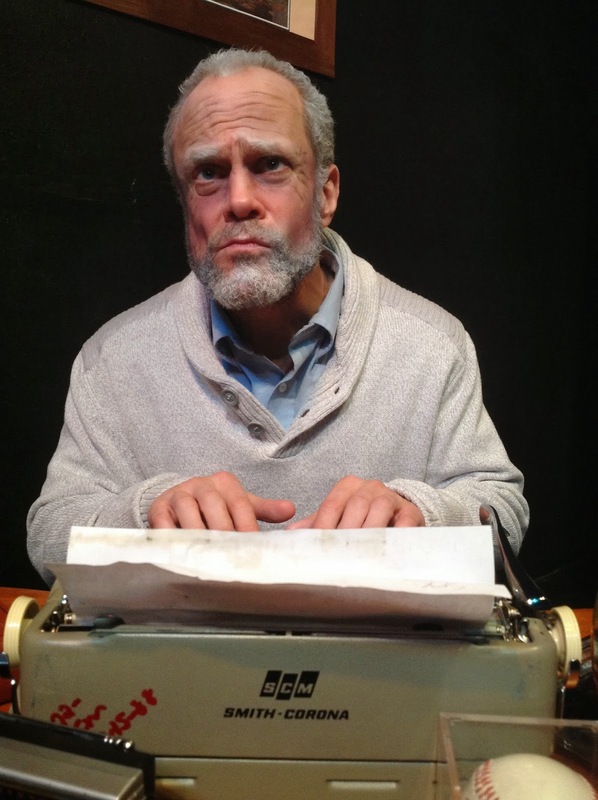 Likewise, I'll now keep an eye out for any more plays written by Mitchell! 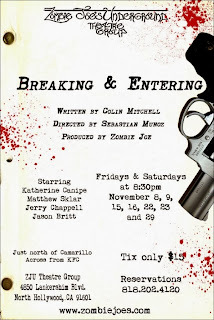 Zombie Joe's Underground Theatre Group, 4850 Lankershim Blvd., North Hollywood, CA 91601. 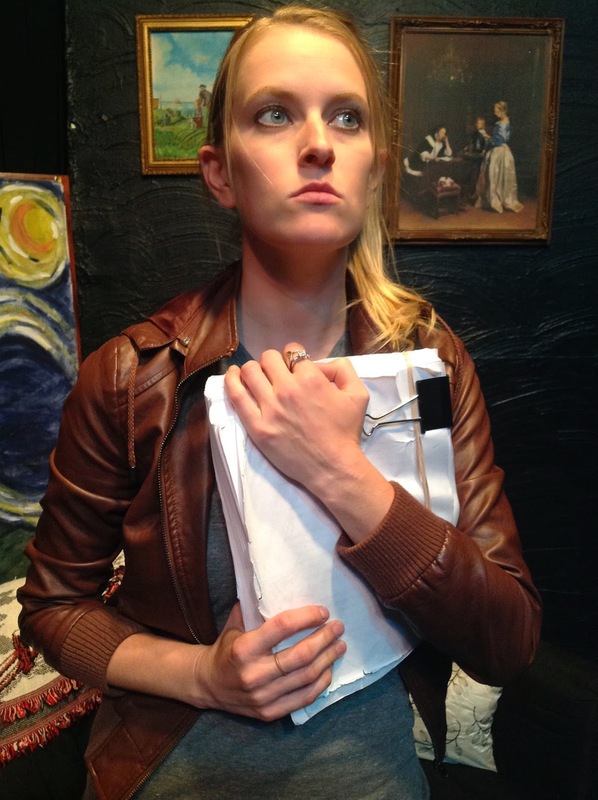 Performances run on Fridays & Saturdays @ 8:30pm, NOV 8 - 29. Sunday evenings at Zombie Joe's Underground Theater make for more "family friendly" fare. 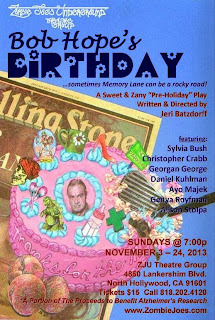 For November this means Bob Hope's Birthday, a dramedy having to do with one family coping with Alzheimer's. The writer/director is Jeri Batzdorff, and she notes in the program she drew upon experiences with her aunt, Cynthia Goldstone. The play comes across as a labor of love, with a portion of the proceeds going to several charities involved with this dreadful condition. I'm at a bit of a disadvantage here. This type of story isn't really to my taste. Honestly, the subject matter lacks the kind of meatiness I prefer. Please note (to belabor the metaphor) I'm not claiming this is the theatrical version of a plum tart or some other desert. Here we do see some of the meat of the human experience--sometimes quite raw. But because this isn't quite to my taste, the fear of misjudging the piece rears its head. Likewise this play falls into what is sometimes called "the well made play" namely it proceed along a completely logical emotional structure towards its target. Honestly, I prefer more surprise. Having admitted that up front, let me also note the most important part of this entire review. I was emotionally moved. Everything else is detail. In fact, you can quite easily stop reading now, having gotten the heart of what this play is all about, how the performance impacted me. I was unfamiliar with the cast overall, and to be honest they seemed a tad under-rehearsed. But that is a nuance. A lot of dialogue was more "on the nose" than I particularly like, yet it worked. One thing I've always liked about soap operas is how characters end up showing lots more facets than we sometimes come to expect. Very rarely do we meet anyone in such (just as in life) purely virtuous or innately evil. But everyone has flaws, miscommunications abound, issues and tensions rarely resolve themselves totally but at the same time people do undergo continuous change. All this is real! If feels true! In that sense Bob Hope's Birthday captures exactly that kind of sometimes-fascinating mundane reality we too often ignore in favor of car chases, gun fights and exploding space ships. That latter makes for spice and sugar coating, while the thousand tiny tragedies and triumphs of everyday life is where heroism often pervades. Ayo Majek has a dual role, initially as a hired caretaker for one Jane Grady (Georgan George) who's recovering from a broken hip and dealing with Alzheimer's. This caretaker has to leave because her own mother is very sick, so Jane's own family have to pitch in. Majek later shows up as a social worker doing a monthly visit. The first helper to show up isn't family per se, but Billy (Christopher Crabb), a friend of Jane's grandson. He's known Jane since his childhood and loves the old lady. Next up is the grandson, Dylan (Daniel Kuhlman) who has a new band and a new girlfriend we eventually get to meet. His grandmother, given her condition, keeps telling him the same stories and forgets nearly everything he says to her. But remains interested and kind. More problematical is Lydia (Sylvia Bush), a highstrung workaholic who warns people she's really stressed, proving the point by snapping at everyone. At least at first. Later we meet Dylan's sister Jessica (Genya Royfman) as well as Betsy aka Bittersweet aka Bitsy, Dylan's new girlfriend and member of his band (Alison Stolpa). I'll fess up--I found Billy, Jessica and Bitsy the most interesting characters. Really wanted to get to know them more. But that is a digression. Ultimately, this play tells of how a circle of family and friends find a point of unity amidst a very personal crisis--caring for someone with Alzheimer's Disease. Not exactly the defeat of Lord Voldemort, but exactly the kind of crisis we often face in real life. It works that way. Towards the end I felt choked up and some moisture in my eye. This, from someone who does not as a rule watch this kind of show! So what can that mean save that it achieves precisely the emotional chord at which it aimed? An achievement, that. No small one! Bob Hope's Birthday plays at Zombie Joe's 4850 Lankershim Blvd. North Hollywood 800-202-4120 Sunday nights at 7pm until November 24, 2013. It really is the kind of play very many people like in the holiday season.